This gavel is in great condition and was a presentation piece. Copper plate on gavel reads as follows / Dated 1941 Presented By The Corona 20-30 Club Won By Red Lands #121 - 1-12-41 Corona26 #23 4-8-41 Beaumont #185 7-17-41 Corona #26 9-10-41 Beaumont-banning #185 2-10-42. Burma shave trade sign is in original painted surface and has original iron eyelets for hanging. Handmade and original painted surface trade sign. This fun and folky sign was used at a farm in the mid-west. This folky handmade and painted trade sign was found in the mid-west and is only one sided. It has a newer chain for hanging but could be put flush on the wall too. This sign dates to the 1800s and reads... Obrien fine cutlery. 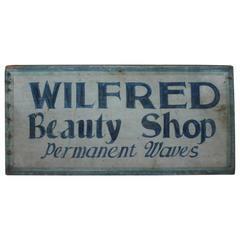 This is a amazing figural two sided sign with a beautiful aged patina. Beautiful wooden antique alter piece with a mint and gold finish. Three-stranded necklace made with African trading beads.